As you can see instead of showing my availability the calendar is being used to steal traffic from my website and send it to VRBO. In the picture above there is a link to vrbo’s website, a login form to vrbo’s website, a facebook login link to vrbo’s website, and a link to created an account on vrbo! All of these links drive traffic off of my website and to vrbo’s website. If you know of other iCal Calendars that need to be in this list please let me know about them in the comments below! What’s cool about rasterizing the URL is that it allows you to display your availability on sites that disallow the VRBO widget, like eBay and Craigslist. 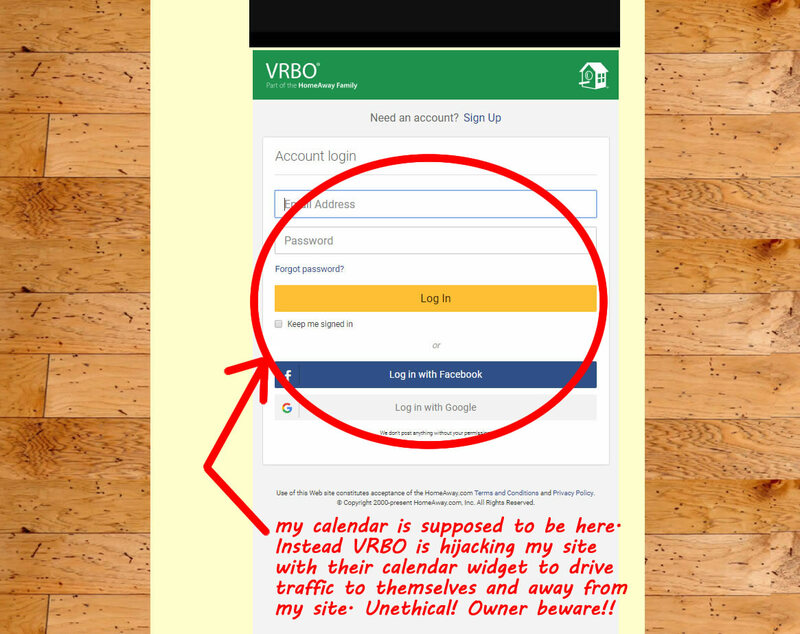 Conditionally rasterizing the VRBO calendar stops VRBO from inserting unwanted links to themselves on your website. Using the conditional php statement above assures that the URL is fetched only when the calendar is being displayed, not when VRBO is stealing your traffic with their login form. I hope that you enjoyed this article, and if you are from VRBO and reading this, why won’t you make your company be like it was back in 2014 and earlier? Why don’t you stop pestering owners with your draconian policies? Please stop making the vacation rental industry the mess that you are making it. VRBO is a LEAD GENERATION SERVICE. VRBO is not a marketplace, and VRBO certainly shouldn’t be handling people’s money and processing payments. Your site is too insecure for that! Please, go back to the way you were and stop all this nonsense that you have been embarking upon for the past 4 years.